Here follows a few cards from our own region which is Northern Europe. These particular cards are all from the last age 4 and represents some of the more modern developments in the region. The Norwegian explorer Roald Amundsen expedition was the first one to successfully reach the South Pole 1911. Before undertaking this expedition Amundsen had previously been working as a seaman. On such a voyage Amundsen received his first experience of Antarctica as the ship was frozen stuck for almost a year. Before returning to Antarctica Amundsen became the first sailor to successfully navigate the whole Northwest Passage. The final expedition to the South Pole and back took 99 days and a tent was pitched at the place where they calculated the South Pole to be. These explorative and scientific expeditions was filled with much prestige which is symbolized by the 3 Victory points in Nations. Although the minus of food might be exaggerated in the game there were real dangers to the life of the explorers during these expeditions. Also they were costly endeavors which often relied on serious state backing. He was an inventor, chemist and industrialist and is one of the most famous Swedes today due to the founding of the Nobel Prize. His most famous invention is the dynamite which was used to great effect in mining and in the construction of roads and railroads. 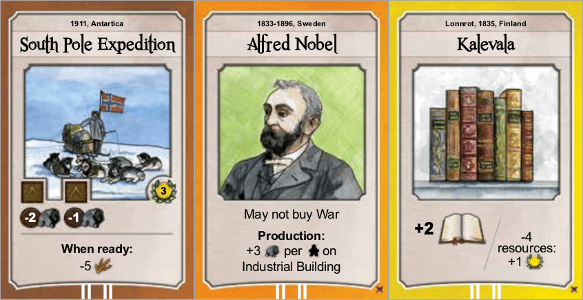 Nobel as an inventor and industrialist is what we had in mind when we created his production boosting effect in Nations. To Nobel his brother Ludvigs death was life changing experience as his identity was mixed up with his brother and he was described as the merchant of death by a French newspaper. In order to change his grimly depicted legacy he decided to use almost all his assets in order to institute the 5 Nobel Prizes. Out of these prizes the other effect of his card is inspired by the Nobel Peace Prize. The Kalevala is an epic poem which was very important in the development of Finnish nationalism. The poem itself was not composed but rather compiled by Elias Lönnrot as he gathered oral traditions of Finnish and Karelian source. The poems in the epic are of various age and the oldest may be up to 3000 years old. The poems cover a multitude of topics from the creation of earth, craftsmanship, hunting, adventure, love and a powerful magical artifact called Sampo. In Nations this card is a golden age which gives you either 2 books or a VP if you pay 4 resources. Is an industrial building one that produces stone? I couldn't find the definition anywhere else. Industrial is the fourth age, so any building from that age.